Royal Botanic Gardens Kew020 8332 5655work Botanical GardenRoyal Botanic Gardens, Kew is home to the world’s largest and most diverse collection of living plants and is a scientific organisation of international renown. Set in a stunning landscape of 326 acres and just 30 minutes from central London, Kew Gardens makes the perfect day out throughout the year with so much for you to see and do. From steamy rainforests to the cool arid desert, Kew’s glasshouses take you to locations far from London and the UK. The Temperate House, the world’s greatest glasshouse, re-opened in May 2018 following an extensive restoration. This breathtakingly beautiful building is home to over 10,000 plants. Go on a journey through different temperate zones from Africa or Asia to South America and New Zealand and discover rare and threatened plants from around the world. For an immersive tropical experience, The Palm House, is a must see. It houses the world’s oldest living pot plant and many plants that have changed the world. Nearby, the tropical waterlilies and climbing plants in The Waterlily House are an amazing sight. The Princess of Wales Conservatory is home to an array of plants in 10 climatic zones, including cacti, bromeliads and orchids. It is transformed each year for the annual Orchid Festival which takes place in February and March, so don’t miss this stunning spectacle of colour in the depths of winter. Kew’s Arboretum is home to 14,000 magnificent trees, some of which date back to the 18th century, and represent over 2,000 species and varieties. This collection is not only of great scientific importance, it also provides year-round interest. Visit the Treetop Walkway for a unique perspective on the Arboretum, from 18 metres above the ground! At over 320 metres long, the Great Broad Walk Borders are thought to be the longest double herbaceous borders in the country - even the world! You’ll see stunning displays from spring through to autumn with around 30,000 plants within the beds. This innovative and inspiring structure stands 17 metres high. It encapsulates the story of honeybees and their important role in the world. The lights and sounds emitted by The Hive respond to the real-time activity of bees in a Kew beehive. The multi-sensory experience of stepping inside The Hive is something special for all the family! There are two galleries at Kew Gardens - the Shirley Sherwood Gallery and the Marianne North Gallery. Enjoy the botanical art on display and look out for different exhibitions throughout the year celebrating the varied ways that artists capture plants. Kew Palace (open from April to September) gives you an insight into the domestic life of George III and his family and the Georgian Royal Kitchens are miraculously preserved. The Great Pagoda is also now open, having been returned to its 18th-century splendour. 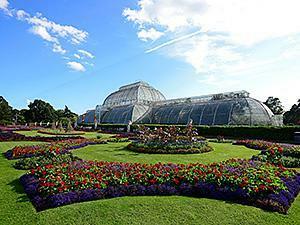 Climb 253 steps and marvel at the stunning views of Kew, and of London, from the top. Royal Botanic Gardens, Kew is home to the world’s largest and most diverse collection of living plants and is a scientific organisation of international renown. Set in a stunning landscape of 326 acres and just 30 minutes from central London, Kew Gardens makes the perfect day out throughout the year with so much for you to see and do. If you’re in need of refreshment then Kew has a variety of options to suit all tastes, from family friendly meals in White Peaks Café to afternoon tea at The Botanist overlooking the Palm House lake, there’s something for everyone. Kew’s shops sell a range of produce, much of it exclusive to Kew. Pick up the award-winning Kew’s Explorers’ Strength Gin or choose from a range of books and gifts to remember your visit.